SARANAC LAKE — Tri-Lakes area air travel and tourism could be altered significantly if President Donald Trump’s proposed budget blueprint is passed with its current call to eliminate program funding to commercial air service in rural communities, including here. To offset major increases in defense spending, President Trump proposes $54 billion in cuts to various federal programs, including slashing the $175 million annual allotment for Essential Air Service. 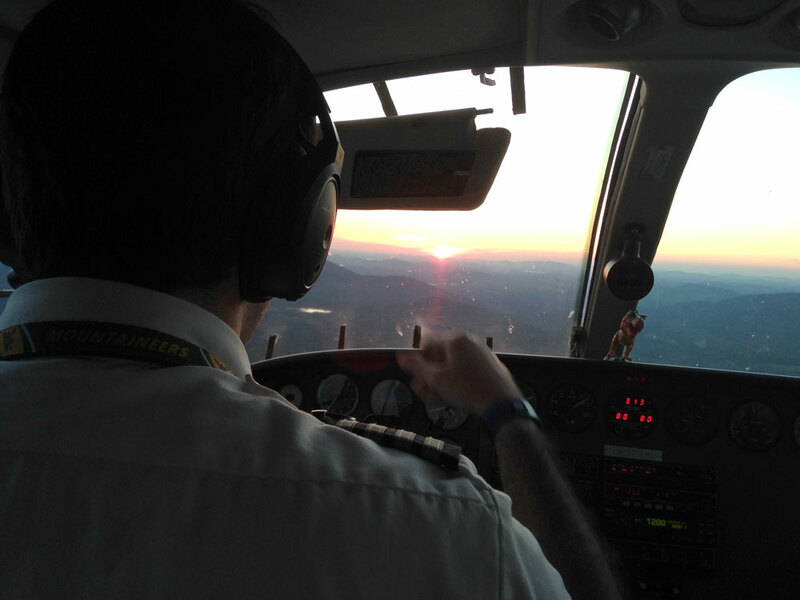 It’s a program that was enacted nearly four decades ago to provide a minimal level of scheduled passenger airline service to rural communities where it otherwise would not be profitable. EAS subsidizes airline service at 159 U.S., 44 of which are in Alaska. Six are in New York, including five in the North Country: Lake Clear, Plattsburgh, Massena, Ogdensburg, Watertown and Jamestown in western New York. In a 62-page proposal released last month, titled “America First: A Budget Blueprint to Make America Great Again,” Trump’s office deems EAS a temporary program from the late 1970s. The executive office’s reasoning for eliminating it is that EAS-funded flights are often not full and have high subsidy costs per passenger. At Adirondack Regional Airport in Lake Clear, manager Corey Hurwitch said the elimination of EAS would have a “wide and drastic effect.” The program provided more than $1.8 million to subsidize Cape Air’s three daily round-trip flights year-round between Lake Clear and Boston’s Logan International Airport on Cessna 402 airplanes, which hold nine passengers each. Cape Air is the only commercial carrier currently flying out of Adirondack Regional, which is owned and run by the town of Harrietstown. To Hurwitch’s knowledge, Adirondack Regional’s annual EAS subsidy is in the ballpark of $1.8 million per year. Meanwhile, he stressed that the ramifications for his airport would be “drastic, for sure” if EAS is abruptly cut without a phase-out period. He hopes the airport would establish “some sort of” commercial service with Cape Air or another carrier. He added that the airport does not have any unsubsidized commercial flights at this time, though during past summer seasons Cape Air has operated a fourth daily flight on its own. “But it became difficult for them to sustain,” Hurwitch said. Airport managers and local elected officials such as Harrietstown town Supervisor Michael Kilroy haven’t wasted time in contacting federal representatives to relay their discontent with Trump’s proposal. Hurwitch said it was agreed to at a recent Harrietstown town board meeting to draft a letter to U.S. Sens. Chuck Schumer and Kirsten Gillibrand and U.S. Rep. Elise Stefanik about the elimination of EAS. Schumer, the Senate’s top Democrat, called the EAS cut “reckless and counterproductive” in a press release. He said the Adirondack Regional Airport served 9,547 passengers in 2016 compared with 13,432 in Plattsburgh, 10,554 in Massena, 8,233 in Ogdensburg and 3,537 in Jamestown. “There is no question about it — access to air travel is good for businesses, good for jobs, good for the middle class and good for financial health of the community,” he said. Adirondack tourism leaders see the potential loss of airline service in Lake Clear as a detriment to the economy as well. In early January when Gov. Andrew Cuomo announced a $38 million investment in an expanded Plattsburgh International Airport as a “North Country aviation gateway,” Regional Office of Sustainable Tourism CEO Jim McKenna was adamant that airport improvements are critical to Adirondack tourism efforts. McKenna has said he views a refurbished Plattsburgh International as a “destination airport” that, paired with Adirondack Regional, would help to bring in more international events and conferences to the Tri-Lakes region. 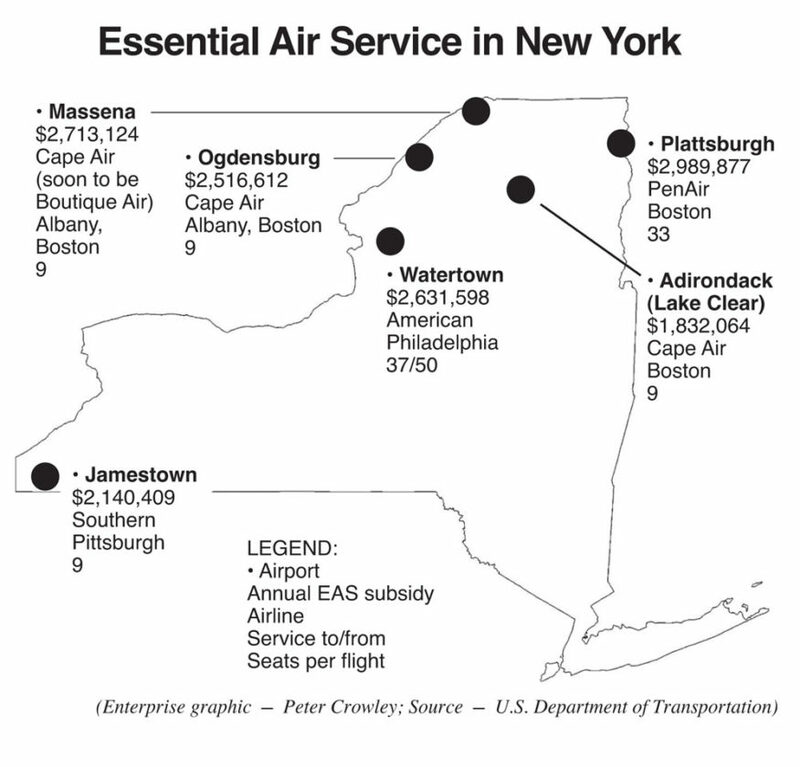 Plattsburgh International also receives EAS subsidies. McKenna is currently wrapping up a trip to Europe with Lake Placid Mayor Craig Randall, working to bring three major international events to the Adirondacks over a five-year span: the International Children’s Games in 2019, the Special Olympics World Winter Games in 2021 and the World University Games in 2023. Speaking from Europe late last week, McKenna said EAS is called “essential for a reason. McKenna went on to stress that EAS funding does not come from the federal government’s general fund. Rather, it is similar to a user fee, such as taxes on aviation fuel and incoming international flights. ¯ Public broadcasting funds for North Country Public Radio and Mountain Lake PBS — NCPR says this would remove 13 percent of its budget. To read President Trump’s full budget blueprint, go to https://www.whitehouse.gov/sites/whitehouse.gov/files/omb/budget/fy2018/2018_blueprint.pdf.